Editor's Note: While our heart has always been buried somewhere in the snowy trenches of northern Iceland, we do from time to time enjoy discovering other literary and art publications around the globe that do what we like to do. SAND is an English literary journal printed twice annually in Berlin, featuring prose and poetry as well as translations, art, and photography. It exists to provide opportunity for emerging authors and artists, inspiration for writers and readers, a chance to engage with the literary scene in Berlin and beyond, and remain a source of support for other communities. Can you tell me a little bit about SAND? How did it come about and what is its goal? SAND has in fact been around longer than I have in been in Berlin. Founded by Becky Crook, the Berlin-based literary journal has been printing biannually for almost ten years! The team has evolved over that time and so too has SAND’s tone of voice. What we aim to represent now are the underrepresented voices across the world in terms of literature and art. 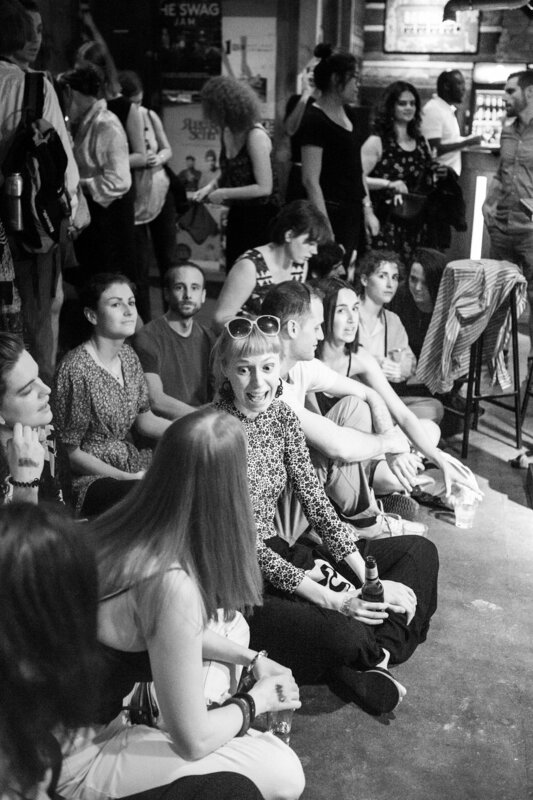 With regular events and an excellent community, our roots in Berlin provide us with the inspiration and motivation to explore our city and beyond in search of poetry, fiction, non-fiction and art that speak to a wider audience. Should society make an effort to incorporate international perspectives in its literature and culture? Why or why not? Yes, yes and yes! To put it quite simply, imagine how boring not only literature, but also art, film and music would be without any international influence? Coming from Ireland, a country that has had an island mentality up until quite recently, I am particularly aware of this and very grateful to be involved in projects that go out of their way to incorporate worldly perspectives. To what extent do you think language barriers are at play in the construction or deconstruction of community? Language certainly plays a role in demarcating communities, creating invisible barriers between those that don’t share the same method of communication. I live on a predominantly Arab stretch of Sonnenallee in Berlin, and have no doubt that if I spoke some Arabic, I would be more connected to my direct community. However, languages and dialects – and even the ways in which different communities use the same language – also serve to create social texture. Not only that, languages are amazing identifiers of a shared community and of the various ways communities have made them distinct over the centuries through accent, vocabulary, inflection and cadence. This is something I notice quite often living away from Ireland: simply bumping into someone from Ireland here brings with it a certain ease of communication I wouldn’t necessarily experience with non-Irish English-speakers. With SAND being very much a believer in building local communities, do you think that digital life has expanded or hindered the development of communities? I think I fall on the side of expanded here. Admittedly though, all I can speak for are the communities that I myself have experience with. As much as I admire and am excited by the many back-to-the-roots communities that seek to preserve and uphold traditional values which have existed for thousands of years, I do think the benefits of digital life have created opportunities for communities we never thought possible. The reality is that digital life is becoming more and more unavoidable now, and the best way forward is to work together with your community, to stay as informed and open-minded as possible. What are SAND’s goals for the future? One of our main goals is to cast our net a bit further afield in all that we do: our events, our submissions and our stockists. We have collaborated with some wonderful organisations in the past, such as the British Council and Ă-Festival, a poetry and translation festival in Vietnam, and we look forward to more interesting partnerships in the future. Currently, our only international stockist is in Amsterdam, but we hope to bring SAND to more bookshelves across the world in the coming years. And finally, our submissions: we want to reach out to communities in corners of the world that our readers perhaps haven't previously explored culturally. We take great pride in representing unheard voices and new perspectives and we constantly seek to develop this core aspect of SAND. One of ICEVIEW’s most prominent themes is that of isolation. Do you think that experiencing isolation and solitude is conducive to creativity and artmaking, or does it hinder these processes? Everyone’s creative process differs greatly. While silence and solitude works for some, bustle and sensorial overload may work for others. While the romantic image of living in a log cabin on the coast of somewhere like Iceland writing a best-selling novel is tempting, I think what fuels creativity – such as location, situation and headspace – ebbs and flows. What is a winning routine for you one year may require a change the next. How would you describe Berlin’s literary community? What are some of its core values? I’ve been in Berlin for seven years now and I am still exploring its literary scene. Although the rumour has been spreading for a while that Berlin is officially ‘over’, I think the creative scene here is very much thriving. With more people arriving here every day you continue to have new voices, ideas and cultures adding to the diverse dialogue of the city. Since 2012, Simone O'Donovan has been weaving her way through the literary scene in Berlin, dabbling in editorial work, publishing, marketing and PR. TI Online is a free, electronic extension of ICEVIEW's printed material Submissions are open year-round.